The Department of Economics at University of Colorado at Boulder is recognized as a very high quality research and teaching department offering BA and PhD degrees. It consists of more than 30 faculty members, more than 70 graduate students, and over 1000 undergraduate majors and 200 minors. Economics is a quantitative, policy oriented social science with a highly developed body of theory and a wide range of real-world applications. Economists seek to describe the process by which societies use scarce resources to attain societal goals and predict the consequences of changes in those processes. Theoretical models, understanding of economic and policy making institutions, quantitative analysis, and the examination of data are all part of this field of knowledge. In general, economists are interested in the economic behavior of individuals. Investigations of the daily decisions that consumers, workers, and firm managers make, as well as the interactions of such economic decisions in markets, is the subject of microeconomics. Macroeconomics refers to the analysis of economic activity of individuals aggregated over many markets. Some of the specific issues of macroeconomics include economic growth, inflation, recession, and unemployment. Finally, international economics investigates the interrelationships among different economies, and in particular studies the pattern of trade and payments between countries. Faculty fields of specialization include international trade/finance, natural resource and environmental economics, public economics, urban and regional economics, development economics, labor economics and demography, political economics, economic history, industrial organization/game theory, and econometrics. 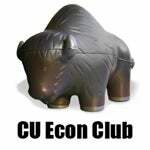 Join the CU Econ Club. For more information,visit the club's facebook webpage. The faculty sponsor is Billy Mertens. To complete the economics major at least 32 credit hours of economics courses are required. The math requirements do not count toward either the minimum total economics credit requirement or in the major GPA calculation. At least 24 credit hours must be upper division courses. For the economics minor, a minimum of 19-20 hours in economics courses is required, completion of more than six elective course credits may be necessary to meet the economics minor minimum total requirement. The elective course list includes all courses historically taught in the Economics Department. Consult the CU Boulder Class Search to review which courses are actively being offered. Environmental and Natural Resources Emphasis: designed for economics majors who are considering careers in fields requiring a thorough understanding of a broad range of issues associated with business practices and public policies addressing natural resource use and environmental quality, including environmental regulation and compliance; energy production and consumption, development of energy, transportation, urban, rural and regional infrastructures. Environmental and Natural Resources Emphasis for students who started before Fall 2016.
International Emphasis: designed for economics majors who have an interest in taking courses with an international perspective both within the Economics Department and in other departments. This program is recommended for Economics majors who are considering careers in international fields, e.g. economic development, international law and diplomacy, international business, or international education. International Emphasis for students who started before Fall 2016. Public Emphasis: designed for economics majors who have an interest in taking courses with a public policy perspective both within the Economics Department and in other departments. This program is recommended for Economics majors who are considering careers in local, state or federal government; in government agencies, in international bodies such as the United Nations or the World Bank; in pressure groups; in politics; in law; in organizations focused on environmental policy; and in organizations focused on other areas of public policy. Public Emphasis for students who started before Fall 2016. Quantitative Emphasis: designed for economics majors who have an interest in taking courses with a quantitative perspective both within the Economics Department and in other departments. This program is recommended for Economic majors who are considering careers or graduate programs in theoretical and applied economics. Quantitative Emphasis for students who started before Fall 2016. All students pursuing a bachelor’s degree in the College of Arts and Sciences who enter the college in the fall of 2018 or thereafter must complete the new General Education requirements. Students who entered the college before the fall 2018 have the option of completing either the new General Education requirements OR the old Core Curriculum.